Updated the declaration of MFC synchronisation variables to work when ATL’s atlsync.h is included in your project. Provision of a number of new classes which provide a C++ object based way of creating the XML for toast notifications instead of having to specify XML text directly. 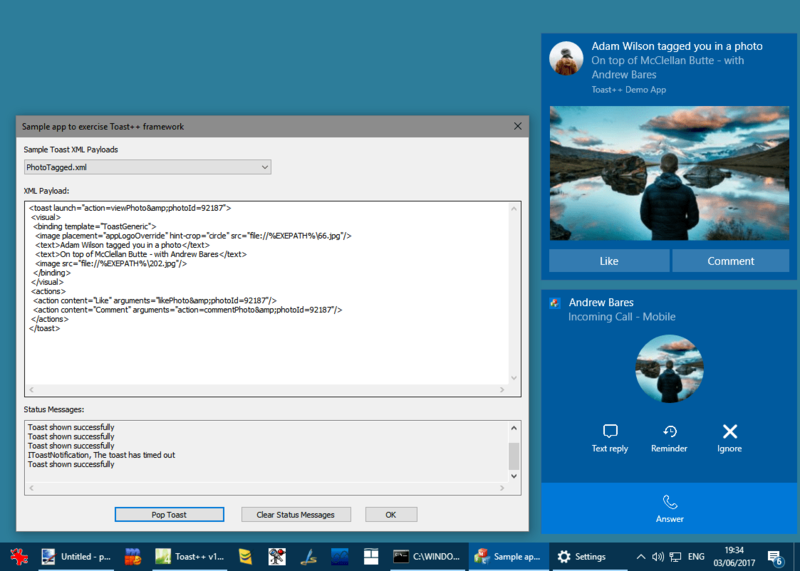 This functionality is based on the UWP Community Toolkit Notifications package. Currently these classes uses MSXML6 rather than the UWP XML parser as I was unable to get the UWP parser to operate correctly. If you know how to fix this, please let me know and I will look into reworking the code. Renamed IsWindowsCloud method to IsSEdition. Renamed IsSEdition method to IsLTSB. Made _SCINTILLA_EDIT_STATE class available in ScintillaDocView.h and renamed it to "CScintillaEditState". Thanks to Michael Thompson for requesting this addition. Updated CScintillaView::FindTextSimple to track the initial position and restart searches from the beginning (or end if searching backwards) until the original start position was located. Thanks to Michael Thompson for provided this nice addition. Updated the demo app included in the download to show how CScintillaView::CreateControl can be used. Thanks to Michael Thompson for prompting this update. Just to let everyone know that v1.0 of Toast++ has been released. Toast++ is a set of C++ classes to provide an encapsulation for Toast Notifications for Desktop Win32 applications. These are the popups you see from Windows normally in the bottom right of the screen which accumulate into Action Center. These toast notification APIs are exposed as Windows Runtime interfaces but can be used from standard Desktop Win32 applications with some work. The Toast++ classes ease this integration process. The classes provided are: ToastPP::CManager and ToastPP::CToast. CManager provides a class based encapsulation of an IToastNotifier Windows Runtime interface as well as helper functionality for integrating Win32 applications with Toast Notifications. CToast provides a class based encapsulation of an IToastNotification Windows Runtime interface as well as support for callback notification through this interface. It also provides a method to setup the toast UI via an XML string parameter.